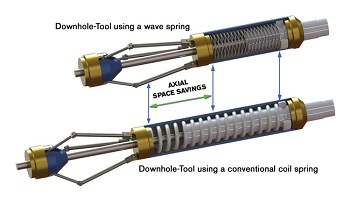 Spiral Wound Multiple Turn Wave Springs, Crest-to-Trough Designs, are used to pre-load anchoring devices of downhole tools that will bite into the casing bore once the tool has been actuated. 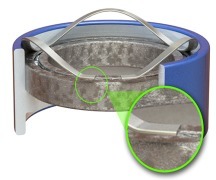 Customer experience has shown that once the slips of the anchoring devices have a good bite in the casing, a nominal load needs to be applied to the heel of the slips to prevent them from de-energizing due to movement during applied loads to the tool. Normally, the required load is provided by a compression spring (coil spring), but these can be replaced by a multiple turn wave spring, crest-to-trough design. In that way the axial space in the application can be reduced, allowing the engineer to design the whole tool in a much more compact way. This saves material and reduces costs effectively. In addition, the wave spring provides a more constant load during the required travel (which is necessary to actuate the tool) compared to a conventional coil spring. These wave springs can also be made from exotic alloys including Inconel and Elgiloy to withstand high temperatures and corrosive environments often associated with these types of tools. Flat wire wave springs offer the best balance of size and spring force. Heres what you need to know to design with these high-performance alternatives to traditional springs.